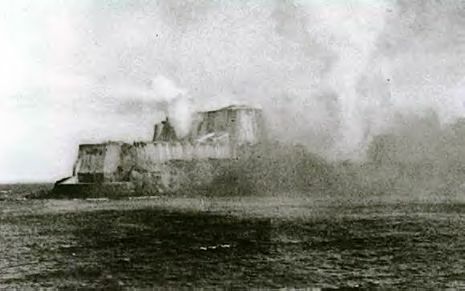 The Battle of San Juan, not to be confused with the Battle of San Juan Hill, refers to an American naval attack on the fortifications of San Juan, Puerto Rico during the Spanish-American War. For weeks, the United States Navy had been anxiously awaiting the arrival of the Spanish fleet under Admiral Pascual Cervera y Topete, unaware that he had already eluded them and slipped his squadron into the Bay of Santiago. On May 10, 1898, Capt. Ángel Rivero Méndez was assigned the command of the Spanish forces in the fortress of San Cristóbal in San Juan. Capt. 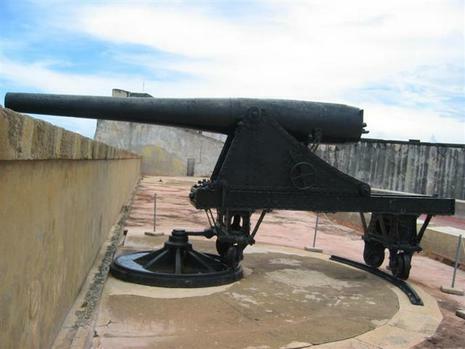 Rivero-Méndez ordered his men to upen fire upon the USS Yale using an Ordoñez 15 centimetre cannon, thus becoming the first attack against the Americans in Puerto Rico in the Spanish-American War. For his actions, he was awarded the "Cruz de la Orden de Merito Militar" (The Cross of the Order of the Military Merit) first class. On May 12, U.S. Admiral William T. Sampson and a fleet of 12 American ships arrived in San Juan to enforce a blockade and bombarded the city, causing and receiving superficial damage. Taking casualties and low on coal, Sampson broke off the engagement and returned to Key West, Florida for repairs and supplies. On June 22, 1898, the USS Saint Paul under the command of Captain Charles Sigsbee arrived to San Juan Bay from Cuba and joined the blockade. Shortly after midday an old Spanish cruiser named Isabel II set off from San Juan to engage the Saint Paul under protection of shore batteries. She opened fire on Saint Paul at long range without success in an attempt to break the blockade. Terror, a Spanish destroyer docked in San Juan for repairs, attempted to cover the cruiser's escape with a torpedo attack but was thwarted when her rudder was put out of action by a direct hit from the Saint Paul. The breaking of the Terror's rudder caused the ship to turn, allowing the Saint Paul to score direct hits near the Terror's waterline, disabling one of her engines and causing her to list. The Terror gave up the attack and returned to port, followed by Isabel II. On June 26 the Saint Paul was relieved by the USS Yosemite, which continued to blockade the port. The residents of San Juan were furious with Rivero and blamed him for the destruction caused to their city by the American bombardments. Nothing came of those accusations and Capt. Rivero-Méndez was ordered to turn over the keys of all the military installations in San Juan to Captain Henry A. Reed of the U.S. Army after the Treaty of Paris of 1898 was signed.